“The best way we’ve found to promote the markets is being able to tell a story around our vendors: how they are connected, where they started out, and why they sell at the market. We’re all about connecting customers to their food sources and creating honest learning relationships.” That’s Market Manager Gaby Gerken of the People’s Food Co-op Kalamazoo Farmers Market. PFC’s new Portage Farmers Market is in its second season, adding more fresh food offers to the Michigan scene. The PFC markets push for honesty and transparency. With over 200 businesses on a seasonal basis, the Kalamazoo Farmers Market has categories that inform customers of who they are buying from, be it ‘Grower’, ‘Producer’, ‘Artisan’, or ‘Retailer’. “We created the market identities and asked for ‘identity supporting documents’ like seed order purchase or wholesale receipts so we could know who is really growing their goods and who is re-selling,” says Gerken. Beyond striving for honesty and transparency, a worthwhile Kalamazoo goal is becoming a zero waste market. Already the first event to offer composting in addition to recycling and landfill, last season the market partnered up with Kalamazoo Loaves and Fishes to lessen the amount of food waste in their community. “Loaves and Fishes approached us after a vendor who owns a bakery mentioned that they should consider gleaning on market days. We fully support getting extra food to those in need and ensuring that it doesn’t go to waste, so it was a no brainer for us to help them out.” explains Gerken. Volunteers came down on Saturdays at closing time to collect vendor donations and then bring the loot back to be sorted in their warehouse. Over four months, the vendor donations amounted to over 27,561 pounds of fresh food, or the equivalent of 22,968 meals. The market plans to have a food drive this August where market go-ers can buy an extra bunch for the group. PFC markets have taken over our Instagram account! Jump on over and see what they’re all about. Gaby Gerken: The Kalamazoo Farmers Market is going on in its 104th season, and has been at its current location on Bank St. since 1947. Up until 2013 the City had operated the market, but the previous market manager retired and the City then decided to contract the job out. The PFC Natural Grocery and Deli already had experience organizing a small market held in our parking lot, which helped us get the contract for the Kalamazoo Farmers Market. Currently we operate with a full-time manager, assistant manager, and have a few part-time market assistants that help with food assistance programs on market days. We can have up to 125 vendors on a Saturday, but all in all we work with over two hundred businesses, as some come on a seasonal basis or operate occasionally as a daily vendor. A lot of farmers markets are producer only markets, but we allow retailers as well. This includes some farmers who buy from the wholesale markets, as well as vendors like the PFC who sells non-competitive and locally sourced foods that helps make the market a one-stop shop. To help customers know where their food is coming from and what practices are followed, we require labeling into the following categories: Grower, Producer, Retailer, and Artisan. Categories are determined by the percentage of market income that is the result of sales of products grown by their businesses. For example, eighty percent of a growers income must come from the sale of their own products, and if more than twenty percent of your income is from resale, then you would be a retailer. The market furnishes these signs for each vendor, and the labels play a key role in maintaining the integrity of the market and creating trust between customers and vendors. FMC: What is the breakdown of grower, producer, retailer, and artisan? Grower- 53, Producer- 80, Retailer- 19, Artisan- 46, and 14 Community Groups. We definitely have more producers on the market. That’s vendors that are selling prepared food or drink, value-added products, MI Cottage Food eligible products, or processed goods resulting from animals raised by their business. A lot of markets don’t allow those kinds of products, but they definitely complete the experience and create a vibrant market experience, as well as support many new kinds of area food businesses. GG: We are located just South of downtown, right in the middle of the Edison neighborhood. Within a few years the market site will hopefully be redeveloped to include buildings for offices and events, as well as a larger covered pavilion. Our vendors can’t wait for the updates! As for timing, we’re located in Michigan and therefore operate seasonally from May through November. The PFC also operates the Portage Market, which opened in 2016 in partnership with the City of Portage. The market is located near the public library and senior center, and we have around thirty-five vendors each week. Market is open from May through October, and we held a monthly winter market inside during the off season. We’re looking forward to the markets second year, and can’t wait to introduce more cooking demonstrations and the Power of Produce club for kids. FMC: Congrats on Portage coming into its second season! How was the market received its first year were there any challenges or adjustments made? GG: For a first year market, we think it went well! It can be a trouble getting people out on a Sunday, especially on the holiday weekends. Mothers Day, Fathers Day, Memorial, Fourth of July… we take a hit on those days with low customer counts. We’ve also found that by running two markets we do compete with ourselves. 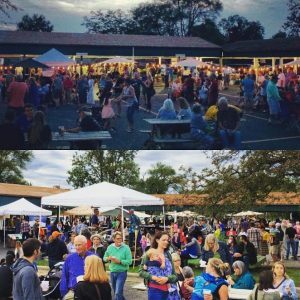 Sundays are much smaller than Saturdays, so we need to find our niche in the community- we’re having free yoga from a local studio on first Sundays now, and have some unique Vendors that won’t be found on Saturdays in Kalamazoo. We’ve also changed the time from Noon to 4:00 to 10:00 to 2:00pm. It helps catch the early birds and those that are coming from morning church services. 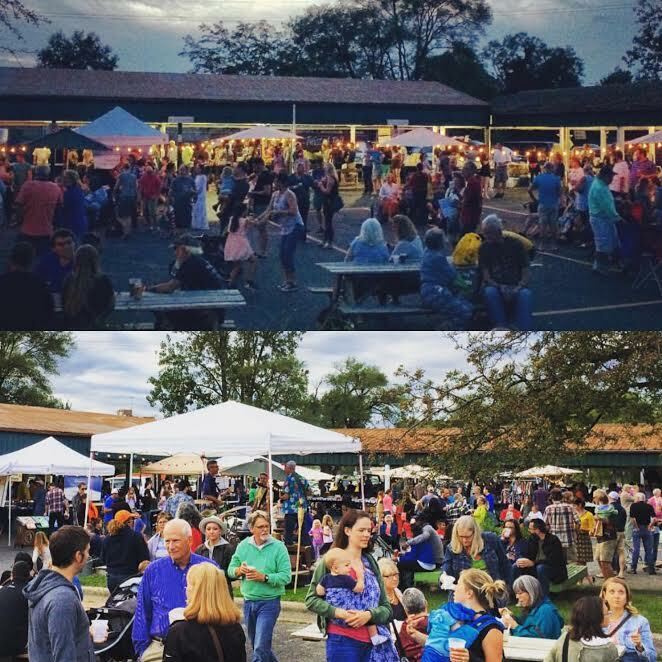 GG: Our favorite events during the season are our Night Markets, which take place on third Thursdays, June through September. Around seventy vendors come down, and there is an increase in the amount of artisans and food trucks that are on site. We partner with the Can-Do Kitchen, a local incubator kitchen (where many of our vendors start off! ), and they provide local beer and wine sales as a fundraiser for their programs. Lights, farmers, live music and yard games- the vibe is great. In addition, some farmers often partner with local restaurants to do demos by their stall, and the market provides a free bike valet service to encourage alternative modes of transportation. Last season we even joined Bicycle Benefits, a national program that gives small discounts to those who ride. The market also participates in many food assistance programs, including SNAP, Double Up Food Bucks, WIC, and Senior Market Fresh. All in all, vendors redeemed $82,921 in these currencies during the 2016 season in both Kalamazoo and Portage. The Double Up Food Bucks program is simply amazing: it’s an incentive program where SNAP recipients can double up to twenty dollars to use on Michigan grown fruits and vegetables. Twenty dollars becomes forty, which means low-income consumers eat more healthy food, local farmers gain new customers and make more money, and more food dollars stay in the local economy. FMC: How does Bicycle Benefits work at the market? GG: Bicycle Benefits is a national organization and we’re listed as a participating business on their website. Last year we had around twenty individual vendors giving discounts to customers, but found that to be a little difficult and confusing- no one wants to trek around the market holding their bike helmet. This year the market will be giving $2 in Market Bucks (our currency for credit/debit cards) to those who ride their bike to either market and show their helmet and sticker to staff at the office. GG: The best way we’ve found to promote the markets is being able to tell a story around our vendors: how they are connected, where they started out, and why they sell at the market. We’re all about connecting customers to their food sources and creating honest learning relationships. Most of our promotion comes from online news, local print magazines, and community partnerships. We invested a lot into our website, which includes sustainability and nutrition related blogs as well as vendor profiles and maps with locations. We also have active Facebook, Instagram, and Twitter profiles for all of our markets, and get a lot of response to events and day-to-day activities through them. Facebook is great for spreading the word on various events, while Instagram is the place to share photos of our flawless fresh produce, no filter needed. GG: In a way, our market is divided in two: we have a covered pavilion space as well as an inner courtyard where vendors set up tents. It’s a success and a challenge at the same time. On the one hand, the courtyard took back the pavement from cars and opened it up for pedestrians and more local businesses. Forty vendor spaces were added, as well as a music stage and plenty of picnic tables for mingling. But this space is also heavily dependent on sunshine and clear days, as customers don’t seem to like getting wet while shopping… Rain is great on any other day besides Saturday! FMC: Any new programs on the horizon? GG: We’re starting a new program this season called Kalamazoo Cooks. Every Saturday at 10:00 am there will be a cooking demo and samples featuring local products and seasonal produce. Our goal is to educate customers and make sure they know how to use the products grown in our area. We received a donation from one of our local hospitals so that we can buy produce and other products from Vendors the morning of too. Chefs come a little early to shop the market before setting up for the demo. It’s a great addition to the market!